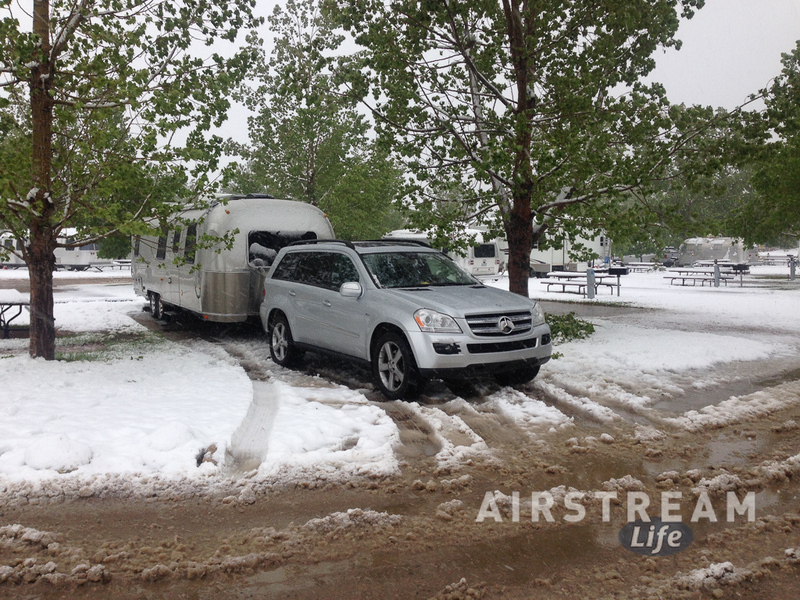 When I bought the Mercedes GL320 in 2009 to be our new tow vehicle, I knew I was taking a big risk. At $66,000 (out the door, tax included), it was almost double the price of the most expensive vehicle we’d ever purchased. Mercedes has a reputation for expensive repairs and maintenance, and their dealer service network is small compared to just about any other brand. The justification for taking this risk is complicated, but the major factor was the diesel powertrain. At the time, only the European brands (Audi/VW, BMW, Mercedes, Land Rover) offered diesel SUVs, and they rack up impressive performance stats. 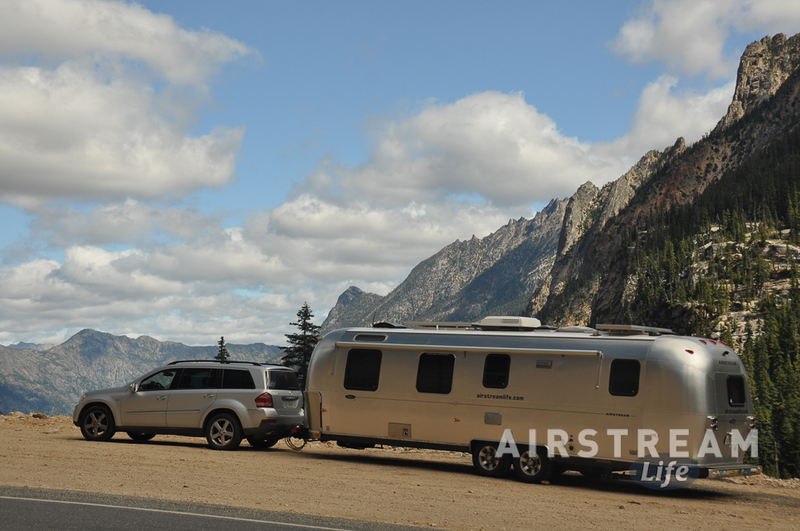 In 2009 when we made this purchase, we were planning on many more years of Airstream travel, so it made some sense to invest for the long term. I felt confident the Mercedes 3.0 liter turbodiesel could last for hundreds of thousands of miles while carting as many as 7 people in comfort and delivering fuel economy (not towing) in the upper 30s. In the past decade the European diesels have also been impressive for their emissions improvements and quietness. I can start my diesel dead cold in the morning at a campground and hardly anyone will even notice the sound, while the exhaust is scarcely more offensive than baby’s breath. That’s all very nice, but there is one thing that a tow vehicle must be able to do to justify its existence: tow. Our GL320, despite having 127,500 miles on it, has done as good a job of that as it ever has—until this week. One tiny problem this week managed to cripple it, rendering the GL entirely worthless as a tow vehicle. We had a gentle rain on our last night at Beachside State Park on the Oregon coast. Over a period of hours, a drop or two of water managed to work past the gasket on the right rear taillight, wick through some insulation on the inside, and drip down to a black plastic cover below. This cover has thin vent slits in it because it houses a very expensive electronic device called a “Signal Acquisition Module” (SAM). The water dripped through the vent slits and down to the exposed circuit board inside. When the SAM gets wet, it behaves like any other electronic device when wet: it malfunctions spectacularly. This SAM happens to control most of the functions in the rear of the vehicle, including trailer lights and brakes. Just one tiny drop of water in the right spot means no trailer lights or brakes. This has been a recurring problem. It first cropped up in February 2015 at Alumafiesta after a heavy rain, with the symptoms being taillights that didn’t work for a few hours. I didn’t find the cause until May 2015 at Alumapalooza when it happened again. I dried the computer with a hair dryer and took it to a northestern Mercedes dealer in June. The dealer service tech glopped everything up with black sealant and pronounced it fixed, which it wasn’t. That was a nice warm and fuzzy thought, but three weeks later the SAM decided it had suffered enough from the prior repeated water intrusions, and it died without warning—while towing in downtown Castro Valley, CA. Imagine the fun: suddenly, no brakes and no lights on a 7,500 pound trailer in heavy traffic. This time the hair dryer trick wasn’t going to work. I had to tow the Airstream through city traffic for a mile with no brakes, signals, or lights to a Walgreen’s parking lot large enough to dump it. Then I had to convince the manager of the pharmacy to let me leave the Airstream overnight. Then I had to find a Mercedes dealer and pray that they had the part I needed—on a Friday afternoon. Fortunately Mercedes Benz of Pleasanton had the part and installed it the same day, for $1,300. All was well until last week, when mysteriously the upgraded taillight assembly let in just a couple of drips during an Oregon sprinkle, and our expensive new SAM got wet for the first time. You can imagine my reaction when I got into the car and the dash lit up with five warning messages—and of course, no trailer brakes. After I ranted for a while, Eleanor and I got to work. About 45 minutes of the hair dryer treatment got everything working except the left turn signal and taillight. We decided to start towing toward Eugene OR (nearest dealer location). Two hours later the left turn signal began working again. In Eugene I had a friendly chat with the service tech, in which I explained that intermittent lack of brakes and lights means the car can’t tow. 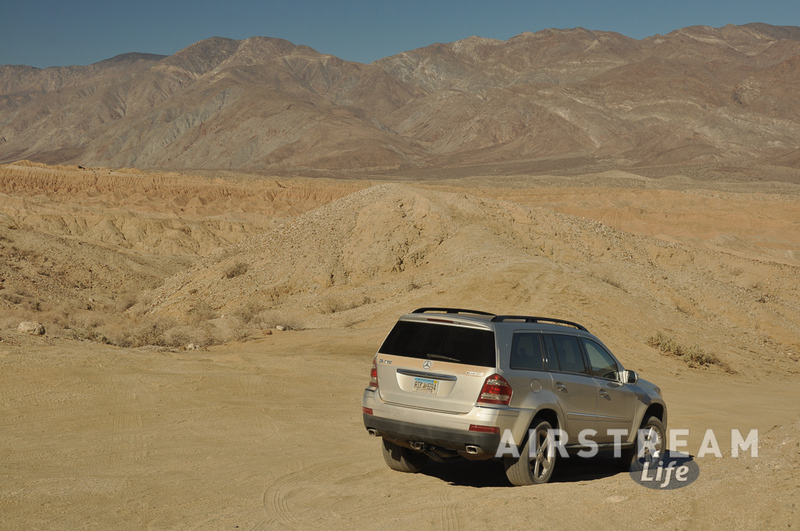 That triggers what I would call an existential crisis for the Mercedes GL320. If it can’t tow reliably after a light rain, I can’t use it. He understood the conundrum, but had little to offer other than tearing apart the interior of the car to look for other possible leak points—at $140 per hour, my expense. I talked with Andy Thomson of Can-Am RV about possible replacement vehicles. Andy has been a very reliable source of information over the years, despite his tendency to terrify Americans with his non-truck towing suggestions. He listed the Audi Q7, BMW X5, and the new Durango (based on the Mercedes platform) as possible replacements, but pointed out that my GL has relatively little trade-in value. Worse, there are no suitable new diesel SUVs available. VW screwed us all on that one. Friends at Mercedes dealerships have told me that Mercedes has quietly suspended shipments of new diesel SUVs to the US. Audi and VW of course are out of the question, and BMW’s X5 might be available but it’s too small for us. So we’ve taken the path of least resistance. The taillight assembly has been replaced again but I’ll never trust it. We are going to rig up a plastic shield over the SAM to block the water droplets. It’s a low tech, easy fix that will probably work just fine for the life of the car. And, despite my momentary lapse of confidence, I think we’ll stick with the GL. Hopefully the SAM will survive this one episode of water intrusion. To be sure I’ll test it a week or two before every trip. I still want to see the odometer turn over 200,000 miles before we re-consider getting rid of it, and more miles would be nice. On balance the car has been everything I hoped it would be: a comfortable, confident driving, capable tow vehicle. It’s amazing to me how something so small—a drop of water— can entirely destroy the practical value of the car. [Nerd Alert] I’m reminded of that scene in “The Fifth Element” when the evil Zorg chokes on a cherry and Father Vito Cornelius says, “There, you see how all your so-called power counts for absolutely nothing now, how your entire empire can come crashing down because of one little cherry.” [/Nerd Alert] We live by a tenuous thread all the time, and little moments like this make that thread briefly visible. I guess there’s nothing for it but to keep on towin’. We’re heading to the California redwoods next. 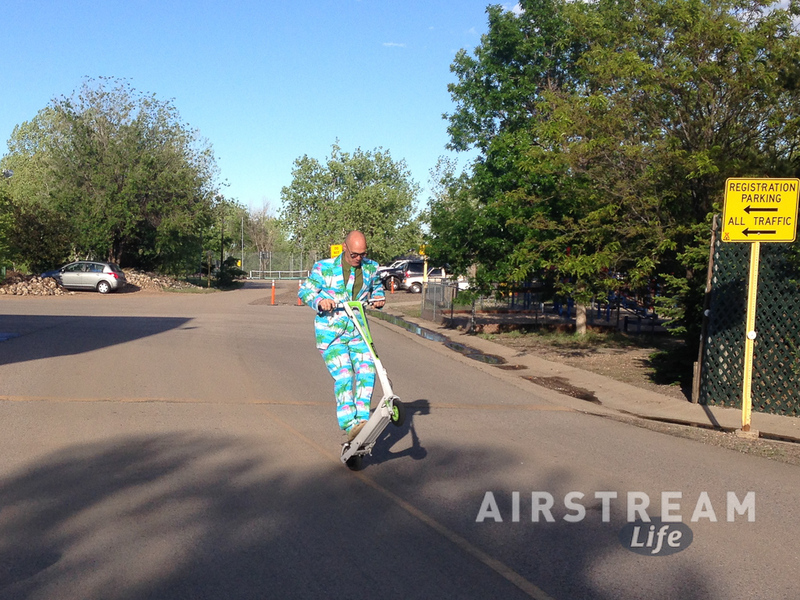 Airstreamers love tech. 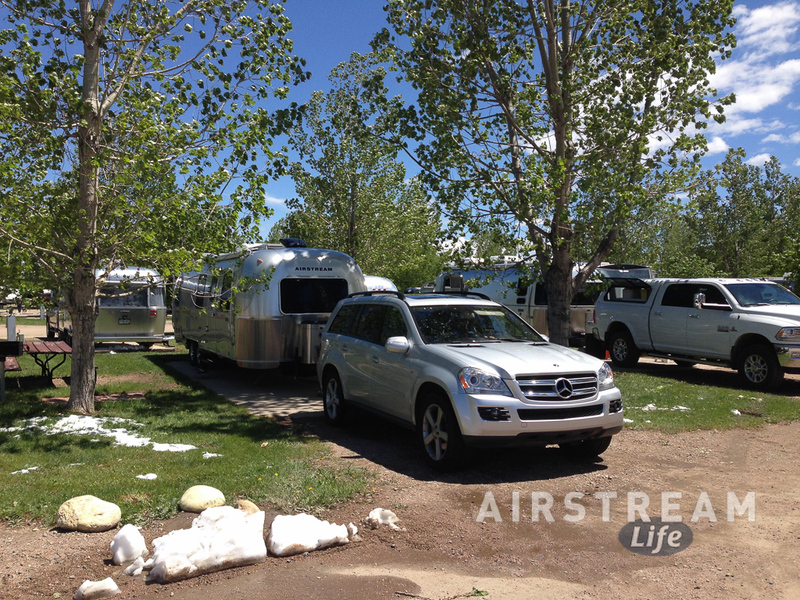 That’s a big change from a decade ago, when most Airstreamers were repelled by technology. When we got into it in 2003 most of the Airstreamers we met didn’t own cell phones (“too expensive,” they said) and the very few who carried computers were considered radical pioneers. How times have changed. 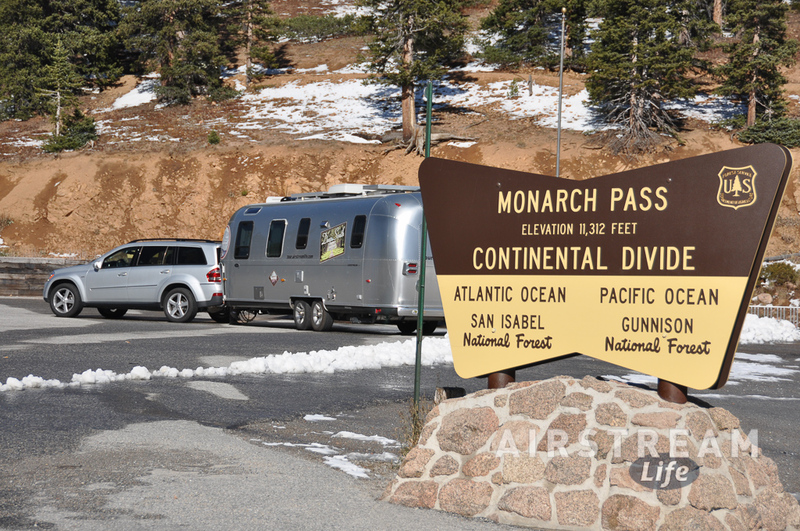 Airstream owners today consider their mobile phones as essential as oxygen, and most that we meet are carrying around a laptop or two, a tablet, and either a wifi range extender or a cellular hotspot. 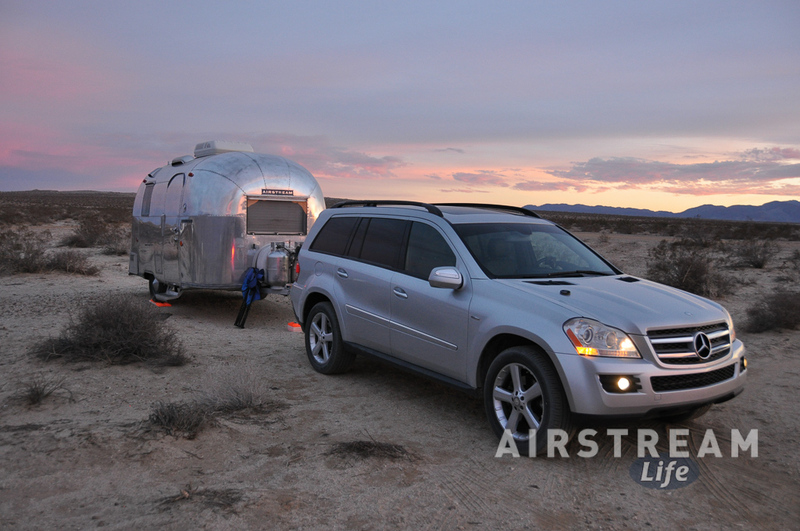 But why stop in the Airstream? It’s fun to load up the tow vehicle with cool tech, even after the manufacturer has already outfitting the dash with an array of colorful displays, trip computers, and a backup camera. There’s a legitimate need for some good toys technological essentials in the cockpit. 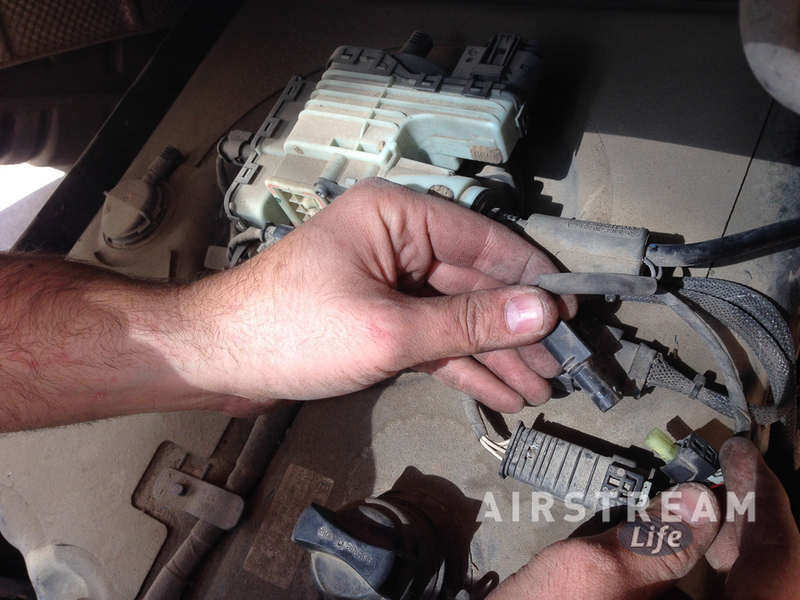 Obviously any Airstream needs a brake controller, but that’s pretty ho-hum. Our Tekonsha Prodigy purchased in 2005 still serves us very well today, so it’s the only thing we haven’t updated recently. This deprives me of the opportunity to upgrade to the latest and flashiest, but on balance I am pleased that it has proven to be such a durable piece of equipment. I never have to think about it, it doesn’t need software updates, and it just works 100% of the time. Silicon Valley, pay attention. In prior blogs and one video I have documented some of the tech gadgetry we use while towing. 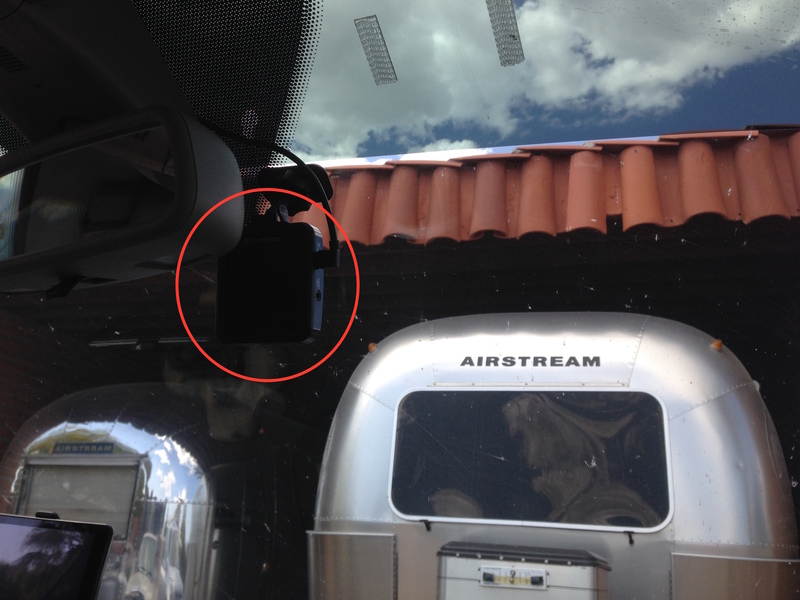 The IngoVision Airstream backup cam is still with us, although I don’t think Ingo is still selling them. If you want a backup cam, there are some good ones on the market at present. The electrical mod from Mid-City Electronics that makes the image appear on the built-in Mercedes display screen is still working just fine too. The only change in this system was back in May 2013 when I relocated the video camera to the upper dome (instead of down low on the rear bumper) to get a better view. The first two Garmin GPSs that we used (“Garminita” and “Garminita II”) gradually got flaky and was replaced by “Garmondo”, who also became unreliable after a few years, and so we are now on our fourth one. I would normally not have much respect for a device that has such a short life space (about three years per unit). However, the GPS suffers excruciating heat while sitting on the dashboard, gets dropped to the floor regularly, and is in operation for many hours each year. Flaking out periodically isn’t ideal but I find that every time we get a new one, its capabilities are significantly better and so ultimately our convenience increases. This one provides lane guidance (really useful when towing a trailer in traffic), traffic reports, has lifetime map updates, and is a lot faster when searching. Plus the screen is big and the touchscreen works much better. I figure the $200-300 that it costs to upgrade every three years is just part of my fixed cost of being a frequent traveler. But Garmin #4 will not get a pet name. Real pets live longer. The latest addition to the dash is a Transcend DrivePro 200 Car Video Recorder. In short, a dashcam. Dashcams are a favorite with truck drivers, eastern Europeans (remember the great meteorite videos from Russia in Feb 2013? ), YouTubers, and paranoiacs. 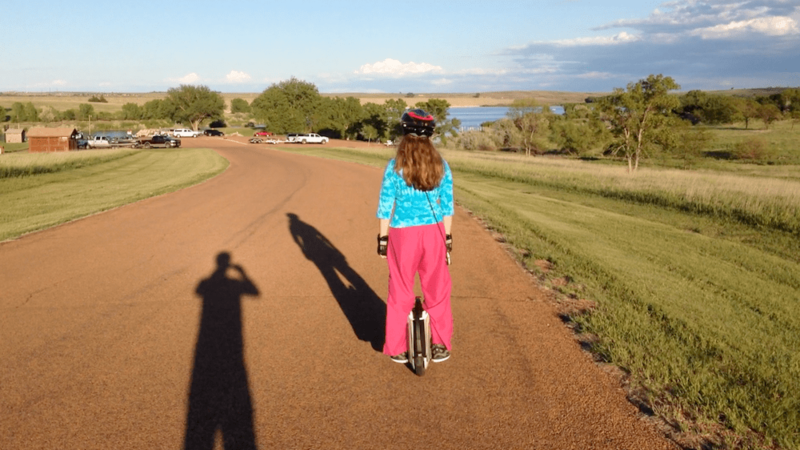 I don’t think I fall into any of those categories, but I do see a lot of crazy stuff on the roads every time we cross the country, and now I’ll be able to document some of it for you. The camera cost about $125. Installation added about $85, since I paid a local car electronics place to remove a bunch of the interior panels and run the power cord discreetly down to a hidden source. This was more of a hassle than it should have been, because Mercedes wired the car to keep all of the 12 volt power outlets “hot” even when the car is turned off. There’s only one outlet in the GL that switches off with the engine, and that’s the center cigarette lighter outlet. The poor guys at the local electronics shop discovered this the hard way. If you install one of these on your tow vehicle, I recommend thinking for a while before you finally stick it to the windshield glass. You want a spot where it can get a good view of everything (which means near the top and center of the dash if possible), but not in the way of the driver’s field of view, where you can get to the controls, and not where it will interfere with other things like the rearview mirror or toll transponders. It took two tries before I got the right spot for this one. Speaking of toll transponders, we carry two of them. One is a Florida Sunpass, and the other is EZ-Pass which works in a bunch of eastern states. 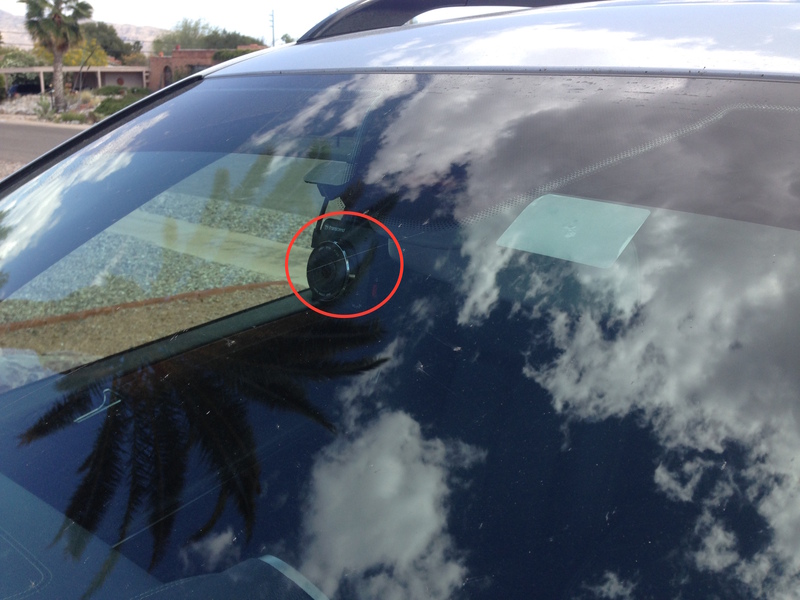 The Sunpass is a permanently adhered windshield sticker that has the advantage of being postage-stamp sized and battery-free. The EZ-Pass is a clunky white box that takes up so much space I only put it up when needed. If we had a transponder for every state that we drive through we’d have no room to see out the windshield at all, so we’ve resisted the temptation to get an Oklahoma PikePass, a Kansas K-Tag, a California FasTrak, a Washington Good To Go! pass, a Texas TxTag, North Carolina QuickPass, Georgia PeachPass, etc. I am hoping that someday the states will manage to make them all interoperable. Not holding my breath on that, though. We used to carry a Doran tire pressure monitor, but for various reasons I got rid of that one and switched to another made by Truck Systems Technologies. This was after going through a couple of other brands and realizing what total junk they were. 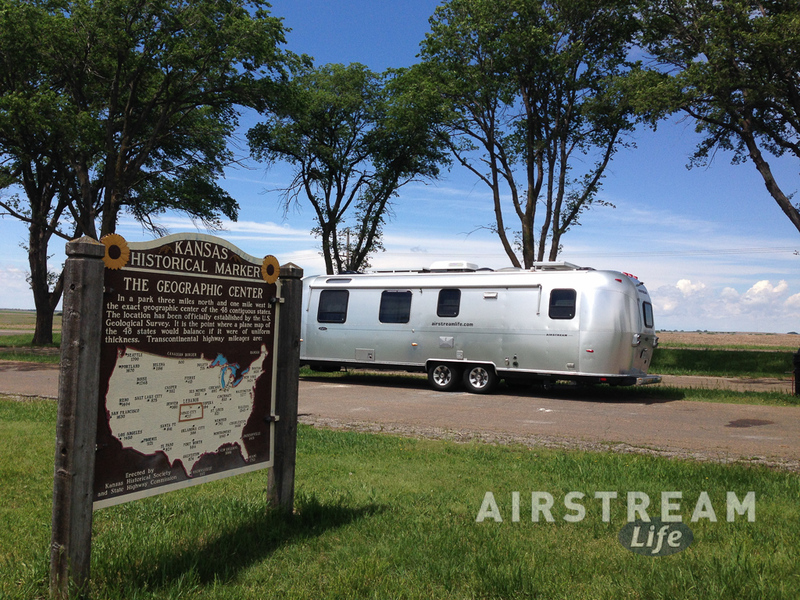 I like the TST unit so much that we are now carrying it in the Airstream Life Store—and if I may interject a brief commercial here, our price is pretty good so please buy one from us! The other piece of tech that has been invaluable lately is my iPhone (or sometimes, the family iPad). Apps on smart devices like these are revolutionizing the way we travel. I have a slide deck that I keep updated with the latest apps that we find useful while traveling, and I present it occasionally at Aluma-events. The presentation is always a hit, because everyone wants to know what works in real-world travel situations. It’s much better to talk to a fellow Airstreamer than to dig through the mostly-useless reviews in the App Store. I keep 8 to 10 apps on my phone for road travel, and would prefer fewer. It’s more efficient to have a few selected and really capable apps than to have dozens that each have some niche functionality. (If you want to know my current list, come to Alumapalooza in Jackson Center in May. We’ll keep online registration open until May 15, and after that you can register on site but it will cost $30/site more.) So if you are looking for apps, I suggest you be ruthless and delete those that you don’t find very helpful. Perhaps I’m getting unimaginative, but I’m so happy with the tech I have that it’s hard to guess what’s coming down the technology pipeline that I would really find useful. Still, it’s undeniable that more is coming. That’s the fun thing about it; there are millions of brilliant minds working on the “next big thing” in software and hardware, and as travelers we get the benefit of that. I don’t know what’s next, but I know this: I’ll probably be evaluating it. Look for my reviews in upcoming issues of Outside Interests news (subscribe via email for free; no obligation). Next week will mark the first official one: my full review of the Xantrex TrueCharge 2. I’ll also post a review of the Transcend dashcam in Outside Interests after I drive 2,000 miles with it up to Ohio this May.